I wanted to share a brief review and a few tips about using Zinsser Universal Sanding Sealer (100% wax free) Shellac. I know for some people finishing their beloved project can be a bit unsettling. I also know that Shellac is one of those “old” finishing options that gets passed over in favor of newer finishes. Now don’t get me wrong, I use a lot of different finishes, however shellac is my go to finish for most of my indoor wood projects. I have used different brands of shellac over the years, however I have found none better than the products from Zinsser. The quality from lot to lot is very good and I have never run into an issue when using their product from differing lots, even on the same project. So if you’re in the market for a finish for your new project you should give Zinsser shellac some careful consideration. When using shellac, one thing I really like is that I never clean my brush. I just let it dry and when I am ready to go back to use it again I just let it soak in the shellac for five or ten minutes and it is ready to go. When applying shellac, make sure you work with some speed as it dries very fast. This is another reason I love using it. Once it dries, a light sanding with fine sandpaper or fine steel wool gets it ready for the next coat. One thing you also need to know about using shellac is that each coat dissolves the previous coat so that when you are finished you have one continuous coat of finish. When you put on your first coat it will be evident if you missed cleaning any glue off when getting ready to finish. This is another area where shellac gives you the advantage of easily removing the glue before the next coat. As I mentioned above, shellac dries very fast so when you come back to re-coat be sure to move along and do not go back over it. If you made a mistake just let it dry and sand out the error. Once the desired number of coats (I usually do at least three) have been applied you are done. You also have the option to wax the finish with a good quality furniture paste wax. Another really nice way to finish your project using shellac is to use 0000 steel wool to apply the paste furniture wax to give you a great satin finish. Another use for shellac is as an undercoating for other stains and finishes, especially on woods that tend to be blotchy when finished. It is also a great undercoat for projects that will be painted when finished, and a great finish choice for restoration work. 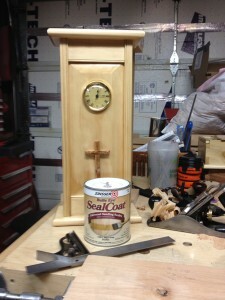 I built this clock for a lady and finished it using the shellac and methods as I have described in this article. 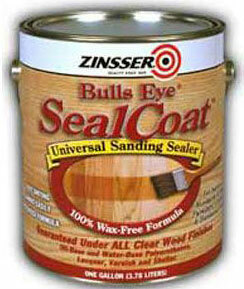 So the next time you’re ready to finish a new product, consider using Zinsser shellac. Once you use it you will find that it is a very forgiving finish with many applications. CLICK HERE to find out more about SealCoat Dewaxed Shellac Sealer and to buy your own.